Good morning! I hope everyone had a lovely weekend. The weather outside was beautiful! Unfortunately, I couldn’t say the same about the inside of my house. It was like an oven! Hot, hot and very hot. Regardless of the temperature, I was still in a baking mood. I generally prefer baking from scratch but there are those days when you just don’t want to be bothered with a ton of measuring. Think about all those dishes and clean-ups! I took a box of vanilla cake mix (you know it’s a good one when you can see all the specks of vanilla beans in the cake) and added basil and lemon zest so it wouldn’t be so boring. Served this with some homemade vanilla cinnamon whipped cream, some raspberries and blueberries —it was delicious! I know it may sound strange adding basil but it really worked in this recipe. Now aren’t you intrigued to give this one a try? Go for it! You won’t regret it. Preheat the oven to 350 degrees F. Grease an 8-inch square baking pan. Using a stand or electric mixer (or mix by hand) mix together eggs, canola oil and milk. Add vanilla cake mix. Continue to mix until batter is smooth. Stir in lemon zest and basil. Pour batter into the prepared pan. Bake for 40-43 minutes or until toothpick/tester inserted into the center comes out clean. Let the cake cool completely before cutting into the pan. When serving, top with whipped cream, blueberries and raspberries. I love the simplicity of this recipe, yet the flavor must be so well done with that lemon and basil.. great share, thanks! This is definitely on the top of my to-make-list! I’m a sucker for whipped cream, especially homemade. The cinnamon and vanilla in this whipped cream really complimented the flavors in the cake. The basil is there but it’s not overpowering. I’m having it for breakfast right now, what a great way to start. I love the way you jazzed up this cake! Lemon and basil (especially the combo) is such an Italian flavor profile, which screams summer for me. Great idea! Great idea Anne!lovely fresh tasty to start on monday …..with a beautiful day! I give you credit for baking on a hot day! I’ve been avoiding the oven lately just because humidity here. I wouldn’t have thought to add basil but it sounds intriguing! I use my bread machine for summer baking. It does not heat up the whole kitchen. And sometimes I plug it in outside! I know, right? It’s so hard to stay away. 🙂 Thanks for your lovely comment Monica. Have a great week! Wow, that’s such a good idea. It sounds delish! I’ve just made a sponge cake this afternoon, I really wish I had seen this before I make it. Never heard of basil in a cake. Looks lovely!!! It´s definitely intriguing, and I always have leftover basil leaves which tend to shrivel until I thow them out! Love this flavor idea! 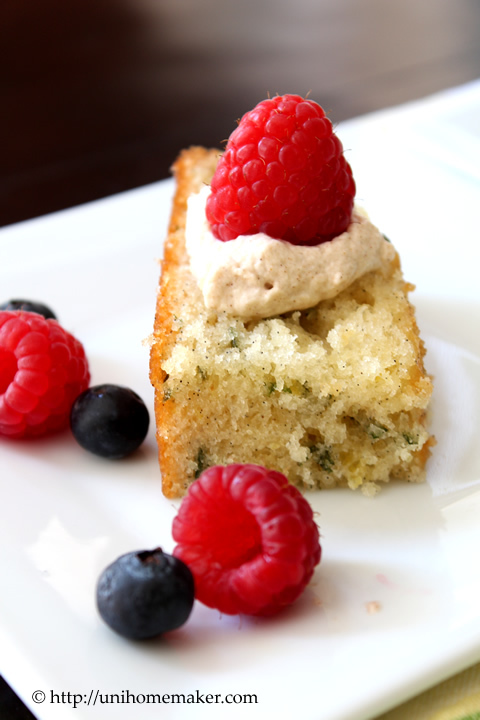 Lemon and basil – what great flavours to add interest to a cake mix! I tried basil in a chocolate cake once, but it was too rich and heavy. Never thought to try it in a vanilla cake… but I will do now! this sounds so intriguing. I have a recipe for a cake using curry leaves – maybe I should get on it sometime..
What a lovely cake…and the flavors shout summer, too! Yum! This looks so good, Anne! 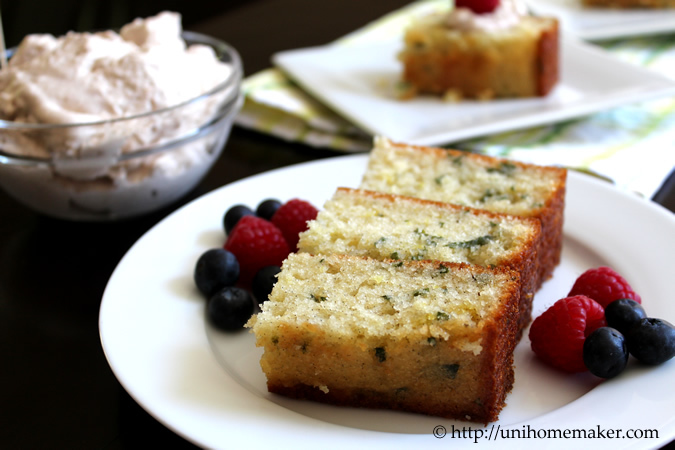 I love lemon, I love basil, I love this cake! Pinned! Basil in cake! I like that basil and lemon is used together. Complementary flavours. 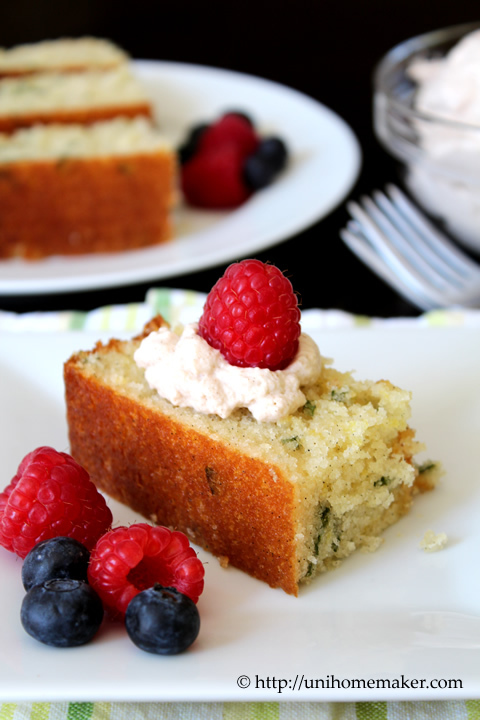 Lemon and basil = perfect summer cake!! Let me tell you… I am all things lemon/basil/raspberry obsessed this time of year, and this cake is definitely calling my name! It’s gorgeous, Anne! This sounds like the perfect cake for summer entertaining. Simple and delicious. I agree with you, a boxed cake mix is the best short cut especially that you add so much wonderful flavors into this cake. 🙂 I’m like you, even though the temperature is high, I still like to bake. Just don’t like to wash the bowl and dishes afterwards. hahaha…. The lemon-basil combination sounds wonderful!!! You are so brave Anne that you were baking despite of the heat! The result looks fantastic, I love the combination of Basil and lemon. The raspberries and blueberries add a wonderful touch of color, very classy! 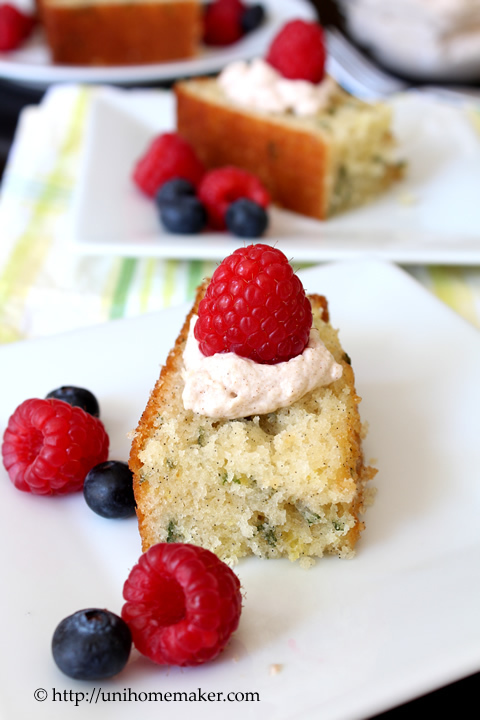 Love the idea of basil in cake! Especially paired with lemon! It’s SO summery – I want to dig right in. I bake in the heat too! I can’t help myself. It was yummy with tea! 🙂 Thank you so much Kiran for taking the time to comment. Lemon and basil go so well together! Perfection! How could I regret basil and lemon in a vanilla cake mix? Looks gorgeous and super yum! Spruced up cake mix is definitely necessary at times! Your lemon basil infusion is GENIUS! Ooh, yum I love the idea of lemon and basil but wouldn’t have thought to put the two together. How creative! You’ve given me an idea for a ice-cream combo there – thanks for the inspiration! Thanks Claire! Oh you’re so right –I would so love to see that in an ice cream –yum! This sounds so delicious and refreshing! Thank you so much Aimee! And thanks for stopping by. I love the sound of this, Anne! I love citrus, and the basil must freshen it up even more. Have a great 4th! Thanks Marcie! Hope you had stellar 4th! Its definitely interesting! What’s the nice idea of using basil! Lovely photos 🙂 Have a cool week! A cake with basil? Love the idea!